It’s the season for standardized tests and end-of-year assessments. Teachers and students are gearing up for these tests by finishing up curriculum and reviewing concepts. 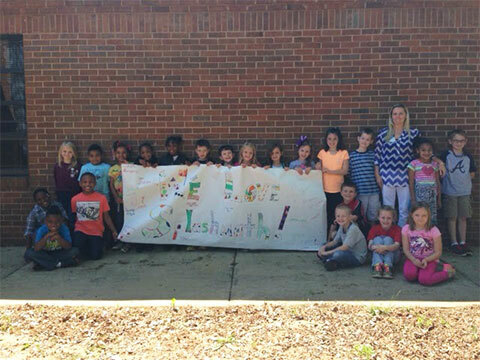 First Grade teacher Mrs. Julie DeFelice shares with us how she is using Splash Math, very effectively, to prepare her students for their end of year standardized test coming up soon. Her class is currently Number 1 on the SpringBoard K-2 leaderboard. Mrs. DeFelice loves integrating technology in the classroom, in fact the focus of her Doctoral study is ‘creative application of technology in education’. 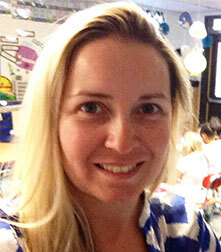 She has in recent years received the Technology Teacher of the Year and Teacher of the Year awards at her school. How are you preparing your students for assessments and standardized tests using Splash Math? A guide from you would be very useful for other interested teachers. 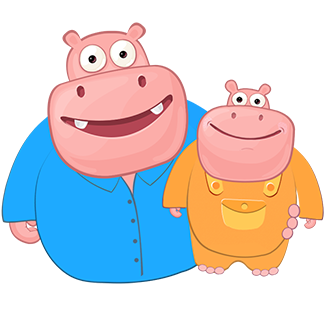 Splash Math is a very effective math learning program for my class, but it is the perfect test preparation tool as well – proving very useful for these last weeks of the school year. 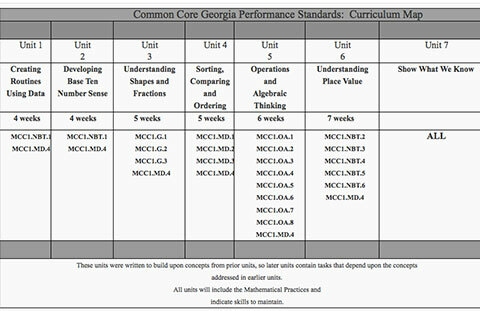 In our school district, we are required to administer and test the students using the Georgia Department of Education (DOE) approved Student Learning Objectives (SLO) tests. SLOs are grade level learning objectives aligned to common core standards, and test for growth in student learning in the school year. A Year Long Pacing Guide defines the curriculum for the year, and we plan our teaching and lesson plans through the school year in accordance with it. My objective for test preparation is to review and ensure students’ understanding of concepts in the Pacing Guide. I follow a 4-step process for this using Splash Math. In this step the objective is to assess the students’ level of understanding and comfort with concepts that have been taught through the year and that they will be tested on. This is an efficient way to assign work that can be checked without having to physically grade them myself. The report on how each student has done against each skill is available instantly, and without any effort from my side. The Splash Math reports work great for assessing how my class is doing by student / by skill. For instance, on this consolidated report, the red areas are a red-flag for me to focus on specific students for specific skills. Essentially without any grading required, these Splash Math reports help me re-assess students, and form the basis for my math plan for each student. The final step is to assign work on Splash Math to students based on the reports. Splash Math does much of this work within the program itself, since it adapts to the performance so far of the student. I find this ability to direct and individualize test preparation practice by student very convenient. That overall is the process for test preparedness in my class, which I follow by standard and strand. It is working extremely well and I like the easy way in which I am able to control and manage the process. My students and I now feel confident and ready for the tests! As someone who is ahead of the curve in terms of tech use in classrooms, what are some other interesting ways you integrate Splash Math in math learning in the classroom? One very interesting way I teach using Splash Math is the Flipped Classroom. I strongly believe in this learning method, as I have seen great results in increased participation and interaction, and deeper and longer lasting learning. 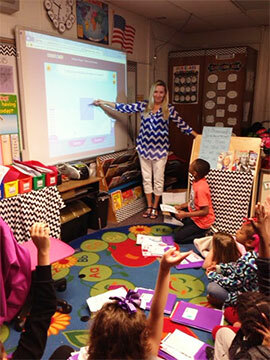 I start by teaching a concept to the entire class using Splash Math, projected on the active-board. I have my students formed in groups, and after I teach the concept they take turns coming up to the active-board and teaching the class. Earlier this was a difficult and uncomfortable task for most of my students, but now with Splash Math, they love coming up to the board! The visual and interactive nature of the Splash Math program results in more discussions – my students have fun talking math and it brings the class alive. After this, they work individually on the problems in Splash Math for that concept. Overall, my students are more involved and immersed in math, the Flipped Class model using Splash Math has certainly contributed to this. In a class that must have students at varying levels, how do you incorporate differentiated teaching? Are you able to cater to the different needs of students who are behind or ahead? Interestingly, a majority of my students this year came to me quite behind in math. Around 5 or 6 students tested ahead of grade, so yes, I do have quite a differentiated class. I have to admit I have struggled through the school year on math with students who were behind. The struggle was first in identifying where the problem lay, and how far back I had to go to teach the math concepts, and then it was difficult to individualize and work to a remedial plan. There would be times when I really would wonder what I was going to do! As for the students who were ahead, I wasn’t left with much bandwidth to create appropriately challenging learning opportunities for them. Once I started using Splash Math I was finally able to incorporate effective differentiated teaching. 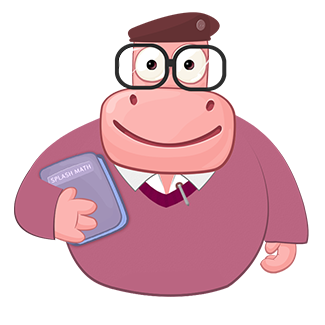 For the students who were behind in math, the first step of diagnosing the issue (where is the problem – how far back did the learning go wrong) became very simple with Splash Math. I had these students do Splash Math at the Kindergarten level first. The Splash Math reports then helped me identify where each student was in each skill set. I used this data to support my plan for each student going forward, so as to work their way to current grade level. I did not have to create or look for different levels of content for different students, I simply assigned remedial work on Splash Math for them to work on. For students who are ahead, I have most of them working on 2nd grade level on Splash Math, and one of them is even on 3rd grade. Right now they’re on the self learning path created automatically in Splash Math, and I oversee and intervene on a need basis. These are some differentiated learning things I would never have been able to do as a teacher, the Splash Math program helped make this possible. What is your students’ reaction to Splash Math? Do all the students like working on it? Absolutely! My students love Splash Math. When I think about the reasons why, I would say it is the instant gratification (did I get that right or wrong?) and just the fun elements in the program design. The students are entertained but not in a meaningless manner – they are learning a lot, while having fun. In fact one of my students was significantly behind and I was considering keeping him back a school year – I am absolutely amazed at the way he took to Splash Math and how well he’s now doing in math. There’s something about the program that really inspires them to try harder – so my entire class, with no exception, loves math now. Here you can see them saying it themselves! What a great system for supporting students learning! My daughter is in first grade but she’s already learning division and multiplication. She’s able to build her confidence in the areas that she finds difficult. This program nurtures self motivation, pride in her skills and a desire to move on to the next great skill. Splash Math is perfect for any ability level whether your child is just starting out or quickly moving along. Thank you Splash Math from a very happy parent! 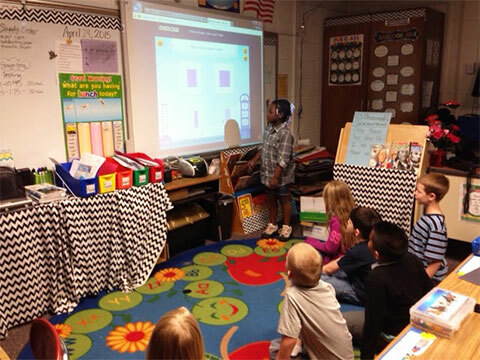 Teachers, check if your students get as engaged with Splash Math as this classroom. Sign up today, it’s free till the end of the 2014-15 school year!